Call Sherman Transit today to schedule an upcoming planned trip for shopping, banking, medical appointments, and more. 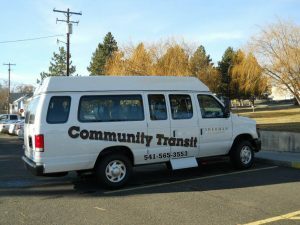 Sherman County Community Transit, also known as Sherman Transit or Community Transit, provides public bus transportation service throughout Sherman County to The Dalles, Portland, and other cities for shopping, medical appointments, and special events. Sherman County receives Oregon Department of Transportation (ODOT) Special Transportation Funds (STF), Federal 5310 Capital Funds, and State/Federal Discretionary Grant Funding to provide priority transportation to seniors and disabled persons — and public transportation to others as space allows. Veterans also are provided free medical rides by appointment. There are no required fares. However, donations are always accepted for all rides, including medical. Suggested Donation: Shopping Bus, $5 per rider. All rides must be reserved a minimum of 24 hours to 48 hours in advance. Monday – Friday: Transportation for prearranged medical rides to appointments. Please feel free to contact Sherman Community Transit with scheduling requests or questions. The office is closed and buses do not transport on Holidays.